Ferrari’s mid-engined missile, open to the elements with a retractable hard-top, and in the UK at last in right-hand-drive format. The 488 Spider is very much the fun-time GTB; carrying a little extra timber courtesy of the architectural bracing needed to remove the monocoque’s roof – and more obviously meant for what even the manufacturer describes as 'hedonists'. Needless to say, such pleasure-seeking comes at a high price – the Spider starts from £204,411 and our test car didn’t stop with the options until it reached £282,728. The essentials, at least, don’t need extra ticking: underneath is the same award-winning twin-turbocharged 3.9-litre V8 and Getrag seven-speed gearbox found in the coupé, the former delivering 660bhp and 560lb ft of torque to the rear wheels. That makes the 488 the most powerful Spider ever, and ensures 0-62mph in 3sec dead. The roof takes 11sec longer to back flip into the body, although it will do it on the move, too. Notable on our test car’s lengthy optional spec list were: Apple CarPlay (£2400), front and rear parking cameras (£3456), 20in forged wheels (£3552) and Daytona carbonfibre racing seats (£6144). Oh, and £1440 for the seat lifter, just in case you fancy ruining the driving position. The GTB, you’ll hardly need reminding, was one of last year’s high points: a five star car, the winner of handling day – and incontrovertible proof that the limitations of turbocharging were not going to prevent Ferrari from turning out yet another mid-engined masterpiece. Realistically, with the allure of a stiff breeze and a better view of the sunset assured, the Spider need only replicate a few essential lines of the 488’s unimpeachable genetic code to be a triumph – and it does so, immediately and memorably. True enough, proximity to the latest V8 is not quite as momentous as it was in the 458 Spider, where to hear the old 4.5-litre unit at 9000rpm was to hear the Almighty bellow at you through a rolled-up newspaper. Yet the sound of its replacement is compelling nonetheless, the twin-scroll turbochargers spooling slavishly ahead of a titanium exhaust-valve production of flat-plane crank falsetto. Even more so now than before, it is impossible to separate exposure to the noise (even with the roof up you can drop the back window) from the experience of the accompanying speed. With the surrounding airflow incorporated into the V8’s prolific delivery, the 488’s instant pace now seems all the more colossal – and it’s that energy bonanza which most obviously distinguishes the model from its predecessor. Fortunately, as in the GTB, the electric responsiveness and sheer urgency delivered by the blowers doesn’t overwhelm either the effervescence of the control weights or the light-on-its-feet dynamism of the chassis. Rather than feeling like it’s screwing more and more torque blithely onto the road, the Spider still feels crisp, incredibly direct and exuberantly agile in a way not common to every supercar. The only shortfall in its engagement with your critical faculties is perhaps a foreseeable one. The shortfall in rigidity hinted at in Italy is only made more plain by transference to the UK, and is recognisable almost from the get-go in the subtle quiver of structural duress. 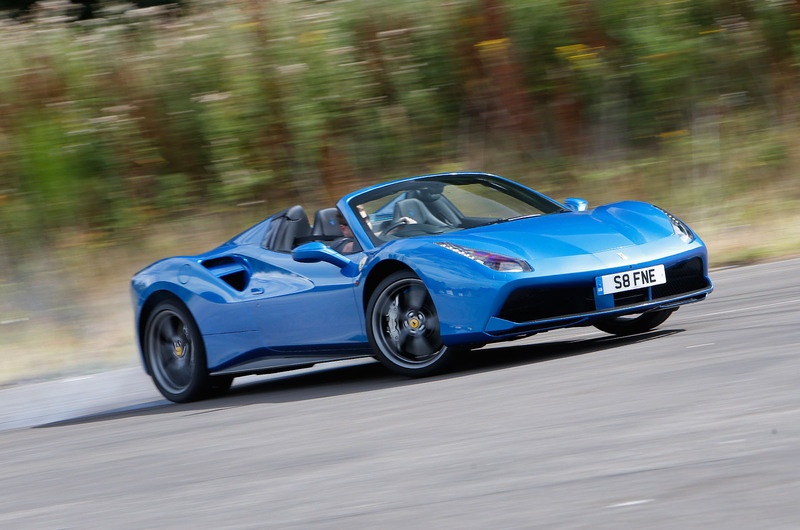 The more forgiving nature of the Spider’s suspension settings and superb wheel control generally keep it from being unsettling (you tune it out as you tune the car’s immense talent in) – but canter into the wrong set of deep and irregular bumps and you’ll feel the 488’s platform physically protest through the steering column and scuttle. It is a general vice rather than a chronic problem, yet it does ensure that the Spider’s comfort levels remain well shy of the nonchalance delivered by McLaren’s carbon tub. Where the model doesn’t stutter is in the reproduction of the 488’s supreme (and wonderfully approachable) playfulness. With the Manettino dial in CT off mode, Ferrari’s Side Slip Control-enabled e-diff lets the rear axle run out of traction so progressively that it’s possible to take giant liberties with all the available torque and not necessarily feel like you’re betting the farm on the outcome. Yes. The Spider isn’t faultless, but the air pocket it places you in is endlessly intoxicating. 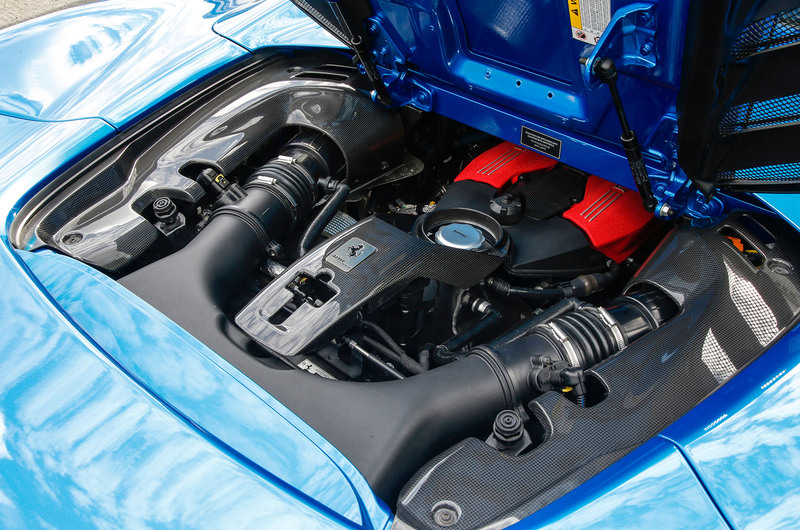 The turbochargers and sympathetic magnetorheological dampers have produced a more amenable car to cruise about in than the 458 Spider ever was. 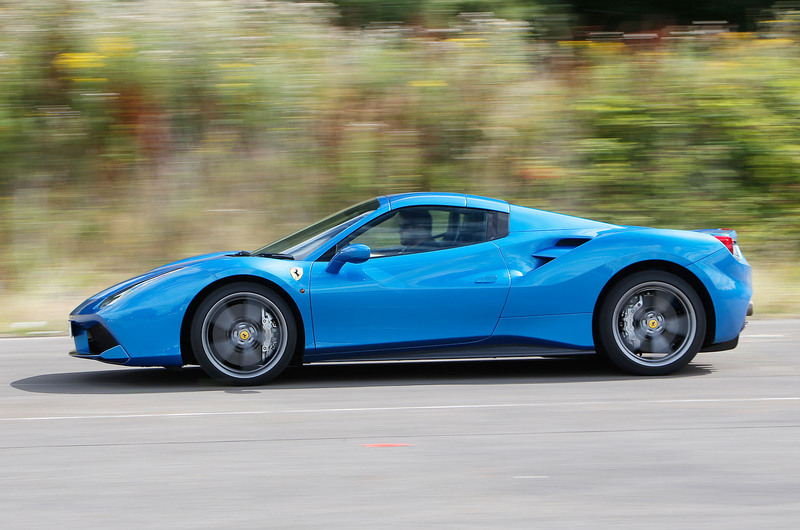 The occasional jolt notwithstanding, the open-top 488 can easily be enjoyed at a saunter, underwritten by the idea that the same fourth gear you gambol along in at 25mph will frenetically dispatch you to beyond 100mph before you can say “court appearance”. Granted, a McLaren 650S is ultimately better rounded, a Lamborghini Huracan LP610-4 better sounding, and an Aston Martin Vanquish Volante better looking – although none ensorcells with quite the same fever-pitch intensity of the Spider. The car is perhaps not quite exceptional enough to choose over the better-sorted GTB if you want the ultimate driving experience; yet easily good enough on its own terms to make the choice between the two an agonising one. Which, I suspect, is as Ferrari likes it. £78k of options is bizarre. £78k of options is bizarre. £16k is specified. What were the other £62k? Not a £282k car. You didn't read the article properly, did you? Notable on our test car’s lengthy optional spec list were: Apple CarPlay (£2400), front and rear parking cameras (£3456), 20in forged wheels (£3552) and Daytona carbonfibre racing seats (£6144). Oh, and £1440 for the seat lifter, just in case you fancy ruining the driving position. The "notable" options add up to £16992 but, clearly, that is not the full "lengthy optional spec list". sounds a bit like taking the mick to me, money down the drain on extras,why don't they just charge a higher price for more upmarket model . There is only one model - Buyers can simply spec it up to whatever level they want/can afford with the options that are available, in the same way BMW sell the M3 or M4. Buyers aren't forced to buy the additional options - Hence the name "options". ...for whom is this article? People with £282,728 to spend. And people who like go dream about what they'd do if they had £282,728 to spend. Awesome things like "a McLaren 650S is ultimately better rounded" than a 488 can only be found here in Autocar. And nowhere else in the planet. Autocar's ability to comment unbiasedly. And that has always been the case. Which is why so many people read Autocar. There are plenty of other scources regurgitating Ferrari's marketing spiel if that's what you'd rather read. Car magazine and sometimes Top Gear will often say much the same. "a McLaren 650S is ultimately better rounded, a Lamborghini Huracan LP610-4 better sounding, and an Aston Martin Vanquish Volante better looking"
ultimately it's really difficult to find a better funny bull s***s than here .. I like to read autocar just for this. As you you try to deny reality, Ferrari is simply above and beyond every other cars.